Everyone will know the names at the top – Apple, Facebook, Amazon – just as few will be familiar with the companies down at the other end: Hudson City Bancorp, SCANA, Stericycle. As to what such performance might indicate about a stock, well . . . we'll let you develop your own theories. Or become a client and you can borrow some of ours. We’ll talk about the most sociable stocks in another post – it has an extra complicating factor we’ll get into then. In the meantime, we’ll see all of you (well, maybe not Warren Buffet) in the social data. 1. A “cashtag” is popular way to specify a particular financial instrument; it is generally understood, for example, that "$IBM" refers to IBM publicly traded stock, whereas “IBM” references the company itself. 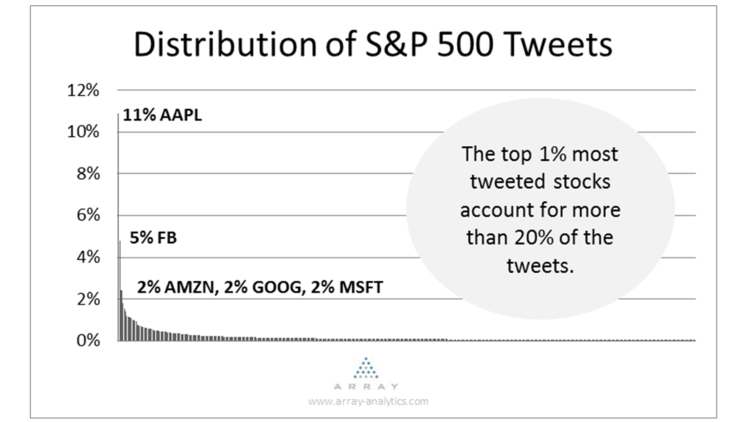 The practice originated on StockTwits and is now common on Twitter. 2. For a variety of reasons, we restricted this analysis to tweets with only one cashtag, although most of the analysis does not vary much if you include tweets with multiple cashtags. And we did exclude a few tickers that changed during the course of the year. 3. An even better normalizing variable might be number of trade transactions rather than dollar value of shares traded, but that is difficult to get on a broad scale with any accuracy.